Left Zoya Rahman, right Ana Rahman. Ana and Zoya Rahman of Mountain Top, Pa., share a similar college experience. They take interesting classes. Join exciting clubs. Make new friends. But these biology majors have a lot more in common than the average student. They’re twins. And genetics isn’t the only thing they share: Ana and Zoya were recently both accepted into the Geisinger Commonwealth School of Medicine. The sisters credit two things for their acceptance into medical school: their scores on the Medical College Admission Test (MCAT)—which differed by one point— and their experiences at Wilkes. Though academics are important to the sisters, they know that how they spent their time on campus would make them stand out in the medical school application process. “Grades are important but being well-rounded, having things you’re passionate about, culture is a huge thing when applying now. They look at everything now,” Zoya says. The two participated in research outside of the common pre-med requirements. Working with professor of biology Jeffrey Stratford, they worked in ornithology, the scientific study of birds. It was a topic that made them a stand-out during their medical school interviews. “We did bird research: that’s not common in medical school students,” Ana added. Their unique experience included sharing summers volunteering with Women Empowered by Science with Debra Chapman, faculty of practice in biology. The program encourages middle-school girls to pursue careers in science. They also worked in the tutoring center with Alberto Prado, coordinator of the learning center, making memories along the way. 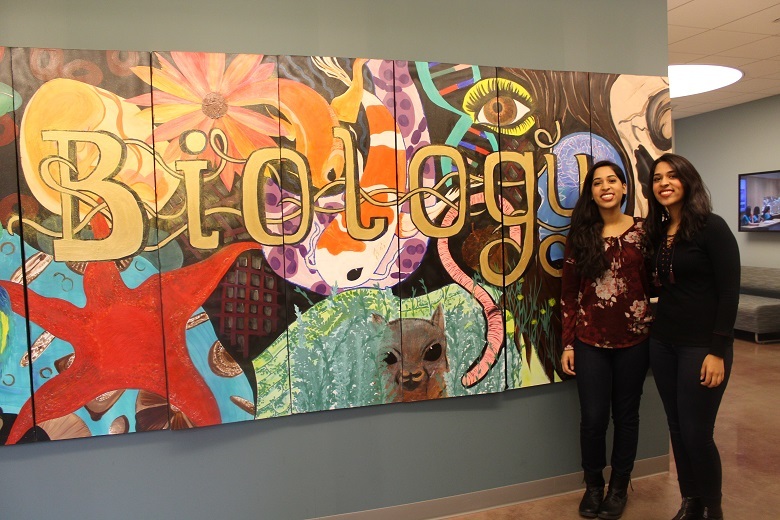 Ana and Zoya were encouraged by assistant professor of biology Linda Gutierrez to apply for the Guthrie Scholar program – a life-changing opportunity for pre-med students. Their acceptance, they explain, is because of the support of Gutierrez. The pre-med students will now complete their Guthrie clinical term this semester as part of the Guthrie Scholars program. The program is designed to give qualified Wilkes juniors and seniors who are interested in pursuing careers in medicine the opportunity to earn 15 credits while gaining first-hand knowledge of the life of a physician. When asked what they are most excited for in the Guthrie program, the answer was unanimous: the life flight helicopter. While they share the enthusiasm for the experience ahead, the sisters do plan to follow different paths once they begin their journey in medicine. With new experiences on the horizon, the sisters admit their closeness to one another is something that won’t change. “At Wilkes, having each other was so helpful because you had someone you can depend on 24/7. We had the same classes, we’d study together—if someone missed notes, the other would have it,” Zoya explains. “Any time we felt the stress of being pre-med, and pulling all-nighters to keep our grade point average up, we could always go to each other.” Now, they’ll continue that relationship into medical school.